Looking for a delicious new potato side-dish recipe? 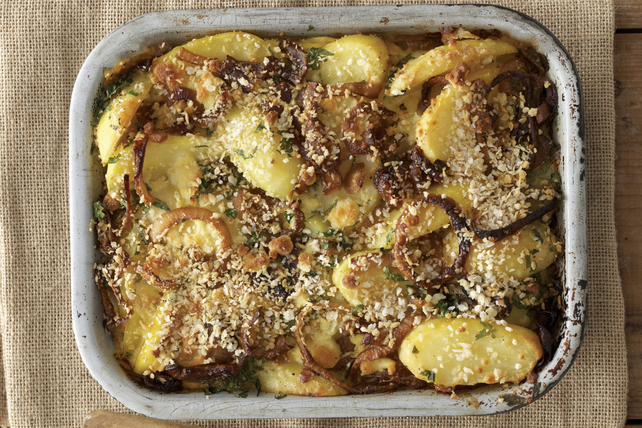 Our French Onion Potato Bake is sure to be a hit! And the pantry staples used to prepare this recipe makes this oh so easy to prepare. Toss potatoes and onions with Parmesan and oil in large bowl. Add 3/4 cup feta; mix lightly. Top with remaining feta, bread crumbs and parsley flakes; cover. Bake 1 hour 5 min. or until potatoes are tender, uncovering after 35 min. For added colour and flavour, chop 1 red pepper. Toss with the potato mixture before spooning into prepared baking dish.